Vision Expo continues to offer students the resources they need to help kickstart their careers. Vision Expo East will take place in New York City March 21-24, 2019. For more information on benefits for students and young professionals, e-mail Diane Tiberio. 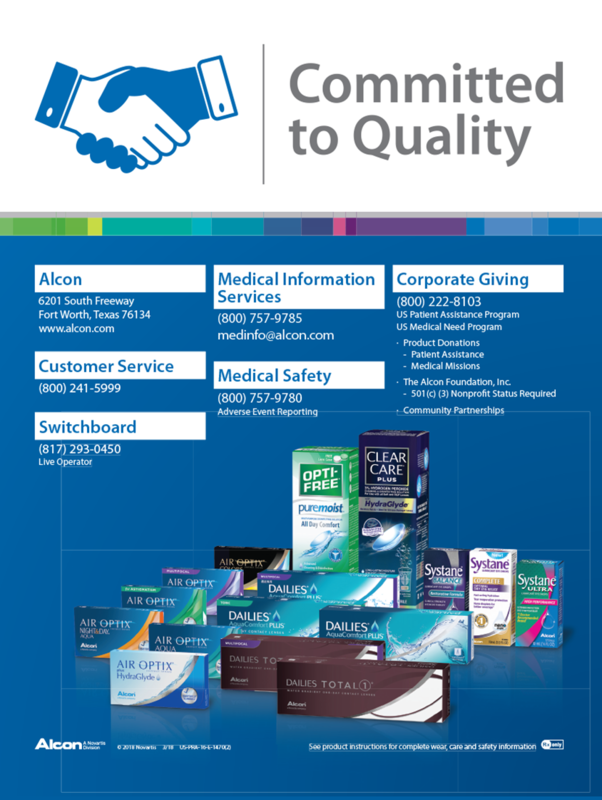 Alcon’s Power of One Program is expanding beyond a contact lens strategy to one that aims to improve overall practice revenue. The new Power of One 2.0 Program is harnessing the power of aggregated consumer health and purchase behavior data to support contact lens penetration as a strategy for improving practice revenue per patient across all goods and services. Toward that goal it will provide best-in-class training. According to new data from the program, contact lens wearers generate, on average, 123% more per-patient annual revenue for optometry practices than glasses-only wearers. Also, compliant contact lens wearers return to their eyecare professional for routine eye exams an average of three months sooner than noncompliant patients; 87% of daily disposable contact lens wearers replace their lenses as scheduled, while only 34% of two-week replacement contact lens wearers do so; daily disposable lens wearers spend up to 77% more annually on all goods and services sold by optometrists compared with two-week replacement lens wearers; and patients who wear multifocal daily disposable contact lenses spend 285% more than those who only wear glasses. Responding to the dramatic increase in the prevalence of myopia in the United States in recent years, Essilor has created a partnership with 14 leading vision experts to take immediate action to better treat and manage myopia. The plan includes the creation of a Myopia Taskforce and the establishment of a recommended protocol for comprehensive myopia care as part of the Myopia Initiative in Action (MIA) program. In 2018, Essilor launched an awareness campaign focused on myopia, particularly myopia among children, which educated parents about early indications of nearsightedness and urged them to schedule a comprehensive eye exam for their children. Refining its familiar iD LifeStyle 2, HOYA Vision Care launched iD LifeStyle 3, a progressive addition lens that addresses patients’ focal and adaptation issues when they have a different prescription in each eye. iD LifeStyle is built on Hoya’s patented Integrated Dual Side Optics platform and incorporates Binocular Harmonization Technology (BHT). BHT ensures that both eyes receive equal accommodative support, according to the needs of each eye, to achieve optimal binocularity, which helps to ensure easy adaptation. Also, iD LifeStyle 3 has three easy-to-prescribe wearer profiles to choose from. Indoor places emphasis on near vision focus; Urban applies equal focus to all main vision areas; and Outdoor puts its primary focus on distance. Options for varying the corridor are also available. Fifteen optometry students are about to embark on a mission trip to Campeche, Mexico, on the Yucatan Peninsula in conjunction with OneSight and its founding global sponsor Luxottica. The students were chosen for the trip, scheduled for May 11-18, 2019, based on a variety of criteria including a personal essay. They are: Rebecca Aquije, SUNY College of Optometry; Lindsey Colliver, Indiana University School of Optometry; Sinead Flood, Indiana University School of Optometry; Astiney Franklin, MCPHS University School of Optometry; Tasneem Maner, Salus University Pennsylvania College of Optometry; Angelica McIntyre, Southern College of Optometry; Lindsay Michaud, New England College of Optometry; Kimberly Murray, Nova Southeastern University College of Optometry; Nitya Murthy, University of Pikeville Kentucky College of Optometry; Lily Nguyen, Southern California College of Optometry at Marshall B. Ketchum University; Sarah Oh, University of Waterloo School of Optometry & Vision Science; Aaron Ransome, University of Houston College of Optometry; Brooke Segerstrom, University of the Incarnate Word Rosenberg School of Optometry; Stephanie Shoults, The Ohio State University College of Optometry; and Montana Williamson, Western University of Health Sciences College of Optometry. Three alternates were also chosen: Nigenda Griffin, Northeastern State University Oklahoma College of Optometry; Celesti Hao, University of California – Berkeley School of Optometry; and Sherene Vazhappilly, University of Waterloo School of Optometry & Vision Science. During the mission trip clinic students will work under the supervision of Luxottica Retail-affiliated doctors performing comprehensive eye exams. They will also help support a core team of Luxottica volunteers in frame fitting and manufacturing and dispensing of new eyewear. The nonprofit OneSight partners with local health organizations, governments, school districts, industry leaders, doctors and volunteers to provide access to quality vision care and glasses in underserved communities worldwide. The National Optometric Student Association supported and promoted this year’s application process. TIME magazine named ACUVUE OASYS with Transitions Light Intelligent Technology as one of the “Best Inventions of 2018” in its annual round-up spotlighting groundbreaking innovations worldwide. The two-week contact lenses not only correct vision but also help reduce exposure to bright light indoors and outdoors, including filtering blue light and blocking UV rays that can affect eye comfort and vision. They continuously adapt from clear to dark and back, helping eyes adjust to changing light better than they would on their own. ACUVUE OASYS with Transitions contact lenses were developed through a strategic partnership between Johnson & Johnson Vision Care, Inc. and Transitions Optical Limited. They’re marketed by Johnson & Johnson Vision Care, Inc.
Bausch + Lomb received 510(k) clearance for use of Tangible Hydra-PEG custom contact lens coating technology with several of its leading Boston gas permeable materials, including Boston XO, Boston XO2, Boston EO, Boston ES and those utilized in the Zenlens scleral lens family. The coating technology gives eyecare professionals the opportunity to enhance contact lens customization for their patients using these Bausch + Lomb lens offerings. In June 2018, Bausch + Lomb entered into a worldwide licensing agreement with Tangible Science, LLC, a company whose mission is to create technologies that improve the contact lens wearing experience. Tangible Hydra-PEG is a high-water polymer coating that is bonded to the surface of a contact lens to address contact lens discomfort and dryness. Click here for more information. Private equity firm Atlantic Street Capital is adding diagnostic equipment supplier Marco Ophthalmic to its Advancing Eyecare Holdings group. The group also includes Atlantic’s portfolio company Lombart Instrument as well as Innova Medical and Enhanced Medical Services (EMS). Atlantic aims to create a North American market leader in distribution of new and pre-owned products, services and solutions to enhance and expand the services provided to the eyecare industry. Upon completion of the transaction, expected by the end of the first quarter of 2019, David Marco will continue as a meaningful investor in the business and will join Advancing Eyecare as Co-Chairman of the newly formed company and help advise the senior management teams. Nidek launched two new software packages for use with the NAVIS-EX centralized image filing system, one for the CEM-530 specular microscope and another for the AL-Scan optical biometer. The viewing software packages allow viewing, calculations and processing of data within NAVIS-EX after measurement with either instrument. With the CEM Viewer, an unlimited NAVIS-EX database is available for reviewing CEM-530 measurement data on an external computer. Data can be reviewed for progression over time and two data sets can be compared for monitoring endothelial changes over time. Images and analyses of the paracentral and peripheral areas can be displayed for a comprehensive image of endothelial cells. The basic functions of the CEM-530 including endothelial cell count can be performed on the CEM Viewer. Scott Filion has been promoted to CEO of Rev360, the company behind RevolutionEHR and a suite of practice solutions for eyecare professionals. Formerly President and COO, Filion now oversees Rev360’s three business units: RevolutionEHR, Professional Eye Care Associates of America (PECAA) and Visionary Partners. The company’s founder and former CEO, Scott Jens, has assumed a senior advisor position to the Board of Directors. In addition, Rev360 named Corey Crawford to the role of Vice President of Operations for RevolutionEHR. Crawford, formerly the Director of Product Management, is now focused on fusing software solutions to create a comprehensive and cohesive experience for customers. Volk Optical appointed Sunil Bharti, MBA, to the role of General Manager, India. In this position, Bharti leads Volk’s sales and marketing organization in India and is responsible for establishing and implementing the strategy for continued growth in the region. He works closely with doctors and healthcare institutions to understand the Indian market’s unmet needs and provide the best solutions from Volk’s portfolio of diagnostic and therapeutic lenses, surgical instruments and ophthalmic imaging devices. Bharti brings more than 20 years of medical device and life sciences experience to the role. Most recently he served as Deputy General Manager of Sales for Perkin Elmer Genomics-India. The annual CooperVision Educator’s Meeting took place in Las Vegas on Jan. 24, 2019. This year’s meeting was the first to be cohosted by CooperVision North America Professional Affairs and CooperVision’s newly formed Specialty Lens Division, led by Juan Carlos Aragon, OD. Along with a think-tank competition and presentations on the myopia epidemic and myopia control, the meeting featured several updates, including that the CooperVision Adopt-a-Patient program is expanding to include specialty lens division products. Lyndon Jones, PhD, DSc, FCAHS, FCOptom, FAAO, Professor and Director of the Centre for Ocular Research & Education at the University of Waterloo School of Optometry and Vision Science, received the International Association of Contact Lens Educators’ 2018 Americas Contact Lens Educator of the Year Award, which was presented to him by Michele Andrews, OD, Sr. Director of Professional and Academic Affairs for CooperVision. According to the 10th annual Transitions Optical Employee Perceptions of Vision Benefits survey, eight in 10 people are plagued by vision-related symptoms at work, ranging from eye fatigue and headaches (half of employees) to dry eyes and blurred vision (more than one in three employees). The survey uncovered two factors specifically — digital eyestrain and light sensitivity — that have been linked with these symptoms and are affecting employees’ ability to do their jobs. While the vast majority of the surveyed employees reported they have taken steps to protect their eyes from light sensitivity and digital eyestrain at work, the survey revealed few are using the right eyewear, such as anti-reflective or no-glare coatings, photochromic lenses or blue-light-filtering lenses, to help. Eight in 10 surveyed employees reported they would be likely to purchase premium lens options if their eye doctor recommended them. To help elevate the importance of comprehensive eye exams and quality eyewear available through vision benefits, Transitions Optical offers a variety of employee and employer focused tools and education. These can be accessed, free of charge, at HealthySightWorkingforYou.org.